Ohagi no tsubone: Many things happened. Partly inspired by the Tanukigoten musicals popular in Japan in the 1940's and 50's, maverick director Seijun Suzuki's as-yet final feature, Princess Raccoon (2005), is a deliriously abstract and stylised fantasy that mixes elements of philosophy and mysticism alongside an approach to film production that is incredibly theatrical in design. Beyond the look and feel of the film - which is really quite extraordinary from beginning to end - and the wider disregard for genre conventions and emphasis on visual storytelling, the narrative of Princess Raccoon is disarmingly simple; essentially dealing with the notions of betrayal and desire and the ultimate in forbidden love at its most fable-like and unrequited; with all of these contrasting ideas presented in an incredibly metaphorical sense, with the allusions to traditional Japanese folklore and certain ideas that would also inspire the underrated Isao Takahata film, Pom Poko (1994), produced by Studio Ghibli. Although this combination of influences and ideas might suggest an impenetrable work that requires a great deal of thought and consideration, the film is never heavy-handed or dense; with the themes being continually disguised by a veneer of colourful farce and giddy fantasy sequences that occasionally recall the style of classic cult TV series Monkey (aka Monkey Magic, or Saiyūki, as it was originally known), with the over-the-top characters, moments of kaleidoscopic colour and strange scenes of imaginative theatrical performance all captured against an artificial backdrop of stage design and lighting effects. It is typical of the defiant approach to cinematic rule-breaking and disregard for conventional storytelling that has been a highlight of Suzuki's work for the past forty-five years, as we see a complete symbiosis between the separate elements of the subject matter, and the self-conscious stylisation of the performances. Here, Suzuki really does indulge himself completely, drawing on elements of Noh theatre, Kabuki performance, Chinese scroll paintings and contemporary music videos, as he plays with a variety of sounds, images and musical motifs to create a jarring melange of ideas that underpin the thoughts and feelings of the two central characters. If you're unfamiliar with the director's work on iconic films like Gate of Flesh (1964), Tokyo Drifter (1966), Branded to Kill (1967) and the more recent Pistol Opera (2002), then you'll no doubt find much of the film a complete shock to the system; with the filmmaker's personal style, combined with the unapologetic reliance on Japanese cultural motifs that require a certain sense of familiarity with the subject, definitely causing a problem for many viewers unaccustomed to this particular stylistic approach. The style may also prove to be something of a barrier for anyone unable to look beyond the sense of camp and kitsch favoured by Suzuki in his vision of the film; with the opulent colour schemes, theatrical facade, blue screen projections, wire-work, musical numbers and action choreography becoming entirely self-indulgent, and yet, perfectly suited to the thematic concerns of the film. Again, such devises may seem jarring or needlessly ostentatious to audiences unfamiliar with the director's work, however, if you make the effort to meet the film halfway - disregarding the more obvious elements of purely nostalgic Japanese iconography and concentrating on the fun and frivolity of Suzuki's style and the deeper themes expressed through the characters - then the film pays off on a number of levels. Admittedly, there are still a few flaws; with elements of the story often grating and occasionally becoming hard to follow. There is also a downside to the film's emphasis on look and style - which eventually overwhelms us and causes us to lose sight of the more human element of the story within the scenes of outlandish, fantastical abstraction. Nonetheless, perseverance and a keen attention span will allow us to keep up with the film's jaw-dropping spectacle, and again, if we disregard the more purely Japanese elements of the script and focus on the central moral dilemma, then the film does work on a more immediate level. Unfortunately, judging from many of the other user comments, it would appear that some elements of the film were lost in translation. A real shame! 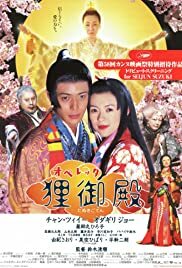 Once again with Suzuki, the film exists, first and foremost, as a work of joyous, escapist entertainment; something that Princess Raccoon delivers in spades.